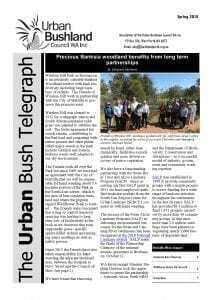 The Urban Bush Telegraph is the newsletter of the Urban Bushland Council. It is the Council’s key medium for distributing news and raising awareness of current bushland and environmental issues. It has a proud history of advocacy and is a vital tool in our task of protecting our urban bushland estate. The Urban Bush Telegraph is published quarterly. The Urban Bush Telegraph Winter 2018. The Urban Bush Telegraph Autumn 2018. The Urban Bush Telegraph Summer 2017/18. The Urban Bush Telegraph November 2017. The Urban Bush Telegraph September 2017 . The Urban Bush Telegraph May 2017 . The Urban Bush Telegraph December 2016. The Urban Bush Telegraph Winter 2016. The Urban Bush Telegraph May 2016. The Urban Bush Telegraph February 2016. The Urban Bush Telegraph November 2015. The Urban Bush Telegraph August 2015. The Urban Bush Telegraph May 2015. The Urban Bush Telegraph February 2015. The Urban Bush Telegraph Summer 2014. The Urban Bush Telegraph Winter/Spring 2014. The Urban Bush Telegraph Autumn 2014. The Urban Bush Telegraph Summer 2013/14. The Urban Bush Telegraph Spring 2013. The Urban Bush Telegraph Winter 2013. The Urban Bush Telegraph Autumn 2013. The Urban Bush Telegraph Summer 2012/13. The Urban Bush Telegraph Spring 2012. The Urban Bush Telegraph Winter 2012. The Urban Bush Telegraph Autumn 2012. The Urban Bush Telegraph Summer 2011/12. The Urban Bush Telegraph Spring 2011. The Urban Bush Telegraph Winter 2011. The Urban Bush Telegraph Autumn 2011. The Urban Bush Telegraph Summer 2010/11. The Urban Bush Telegraph Spring 2010. The Urban Bush Telegraph Winter 2010. The Urban Bush Telegraph Autumn 2010. The Urban Bush Telegraph Summer 2009/10. The Urban Bush Telegraph Spring 2009. The Urban Bush Telegraph Winter 2009. The Urban Bush Telegraph Autumn 2009. The Urban Bush Telegraph Summer 2008/9. The Urban Bush Telegraph Spring 2008. The Urban Bush Telegraph Winter 2008. The Urban Bush Telegraph Autumn 2008. The Urban Bush Telegraph Summer 2007/8. The Urban Bush Telegraph Winter 2007. The Urban Bush Telegraph Autumn 2007. The Urban Bush Telegraph Summer 2006/7. The Urban Bush Telegraph Spring 2006. The Urban Bush Telegraph Winter 2006. The Urban Bush Telegraph Autumn 2006. The Urban Bush Telegraph Summer 2005/6. The Urban Bush Telegraph Spring 2005. The Urban Bush Telegraph Winter 2005. The Urban Bush Telegraph Autumn 2005.